Because of my friendship with Zesty Meyers and his amazing R and Company, I’ve known about the twins Simon and Nikolai Haas for some time now, and have always loved their playful yet exquisitely made designs. They call themselves The Haas Brothers and they have really taken things to a whole new handmade level with their latest collection ‘Afreaks’ which is made in collaboration with a group of local women artisans from the Khayelitsha township outside Cape Town, South Africa. 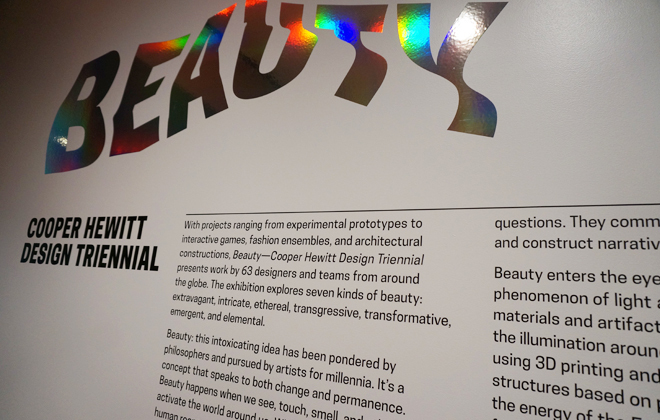 These talented women now affectionately call themselves The Haas Sisters and this amazing collection is currently on view at the Cooper Hewitt’s Design Triennial, entitled: Beauty. Trust me, this is brilliant! The exhibition ‘Beauty’ is organized around seven themes: extravagant, intricate, ethereal, transgressive, emergent, elemental, and transformative, although I could probably use all of those words to describe the wonderful work of the Haas Brothers. 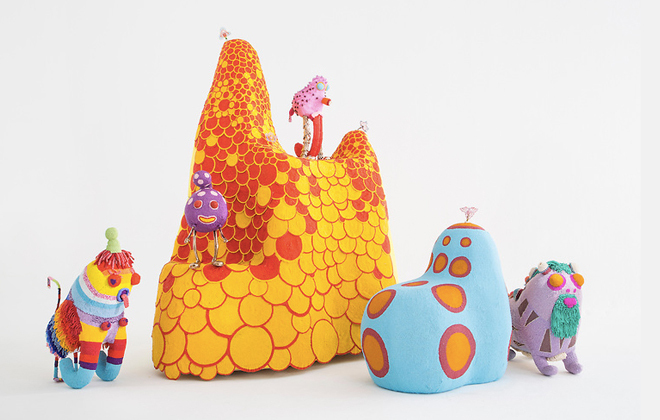 The Afreaks collection is made up of “sheep-sized,” fantastical animals with vibrant colors and strange extremities. 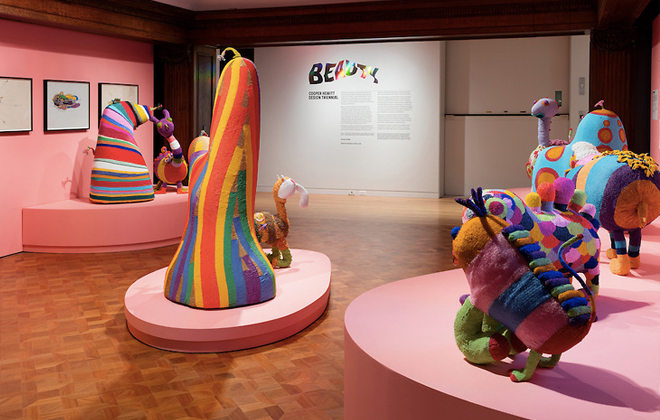 The Haas brothers create the concept and design for these sculptures, which then employ the traditional craft of hand-stitched beadwork by the Haas Sisters. 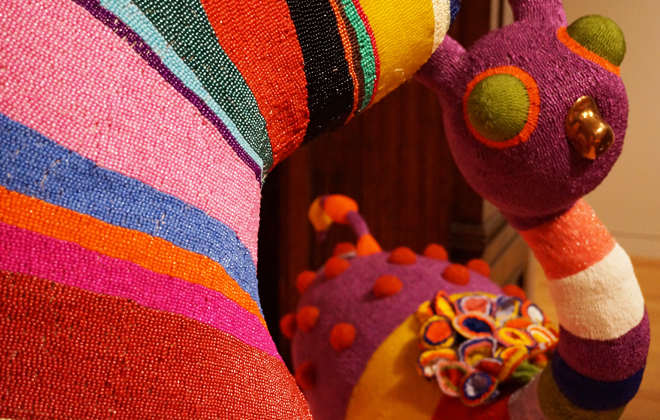 This partnership came out of Monkeybiz, a non profit that promotes local artisans by pairing them with international companies and artists who wish to use their craftsmanship. These local women are then given a steady income of a living wage to produce the objects. That is just the best, isn’t it? 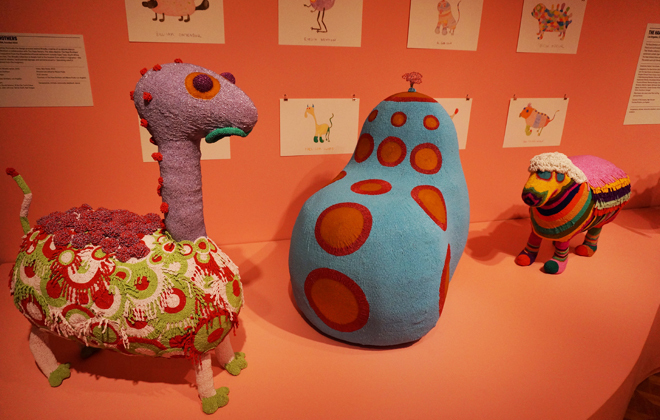 One view of the fabulous exhibit. Kinda love the metallic type here as well. All photos by Interior Monologue unless otherwise noted. This photo is from the Cooper Hewitt for the exhibit. Nice to see them on the white background! 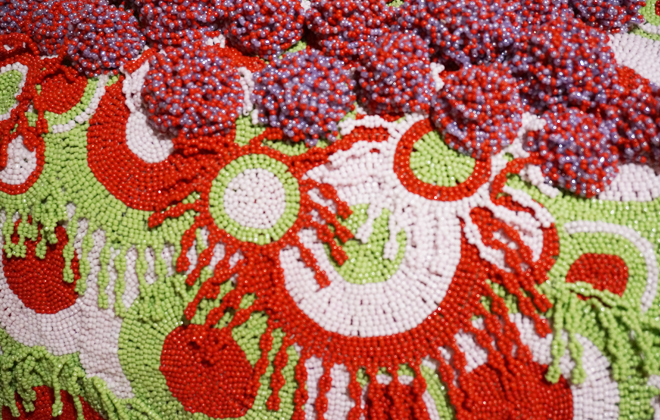 Look at the detail in this beadwork! Stunning. It just makes me smile! I was grinning the whole time I was there. I couldn’t stop taking photos of the beadwork. I took A LOT of them. 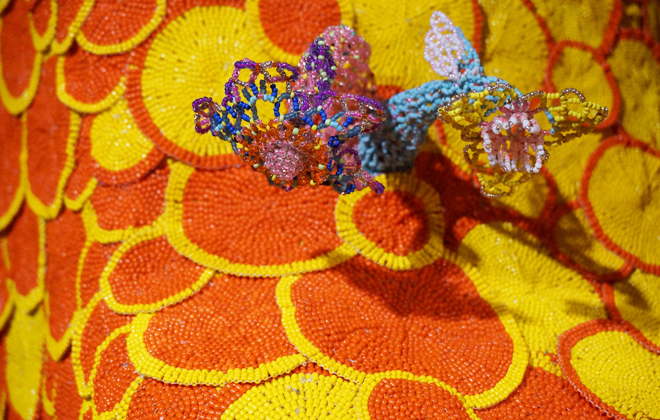 The Haas Brothers were drawn the unique hand-beaded techniques used mostly nowadays to create kitchy souvenirs for tourists, and wanted to find a way to create objects that would employ these techniques in all of their intricate and colorful glory. The process is a very time intensive one, where the small ceramic beads are hand sewn directly to the bodies of the sculptures. 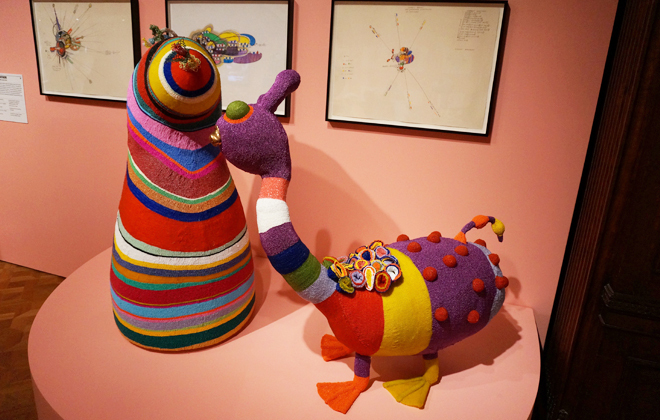 By patterning the colors, or sewing the beads into looser loops, or tightly clustered balls, they are able to achieve a wide range of textural and surface effects, which adds to the playfulness of the created creatures. It’s this playfulness and fantasy that is all too often missing from the ultra-serious design world, which is why I love the Haas Brothers. They aim to make light of their work through context, giving their works cheeky titles like “John Lit-Cow” and “Tail-Or Swift,” of the Afreaks series, or “Fatty and Skinny” which appeared in my favorite London hotel, The Rosewood. But although they cast light with funny names, you can’t deny their acute attention to detail, and their exquisite craftsmanship is on par with the best.